When people ask me if I like surprises, I’m usually a little wary…I’m not that into surprises, particularly if they involve some sort of unwanted public attention or an ‘adventure’ I’m not quite prepared for. That said, I do like spontaneity, as any of my sometimes exasperated friends and family will attest…as structured as my weekdays can be due to work, my weekends often devolve into spontaneous mini (mis)adventures as I bumble around doing errands, chores, and whatever else catches my whimsy, in the kitchen and outside of the house. In the cities I’ve lived in, I often can not resist the urge to explore yet another neighborhood or find an excuse to get outside to satisfy my restlessness. 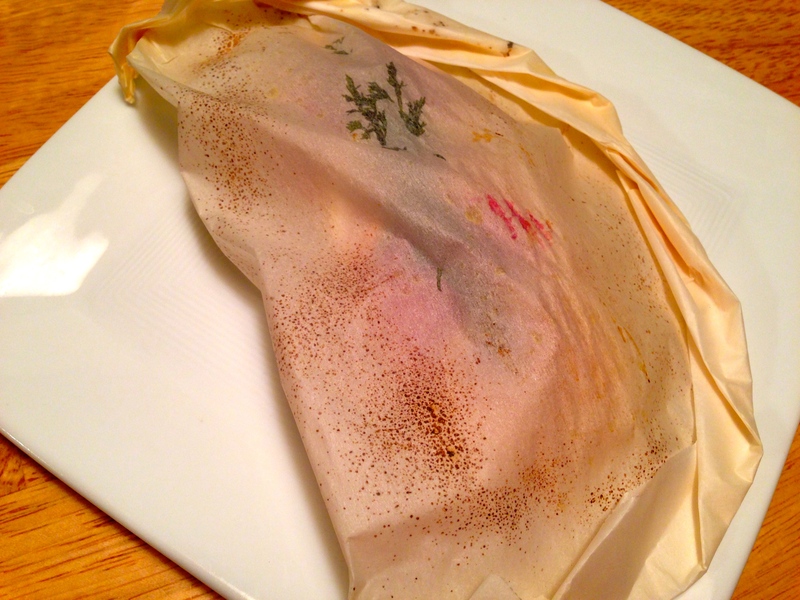 In the kitchen, one package I never mind opening is anything en papillote. 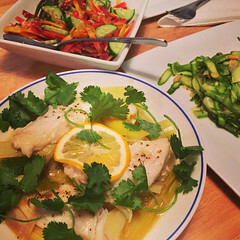 I first tried the technique a few years ago, and recently rediscovered the delight of being presented with a ‘surprise’ for dinner. 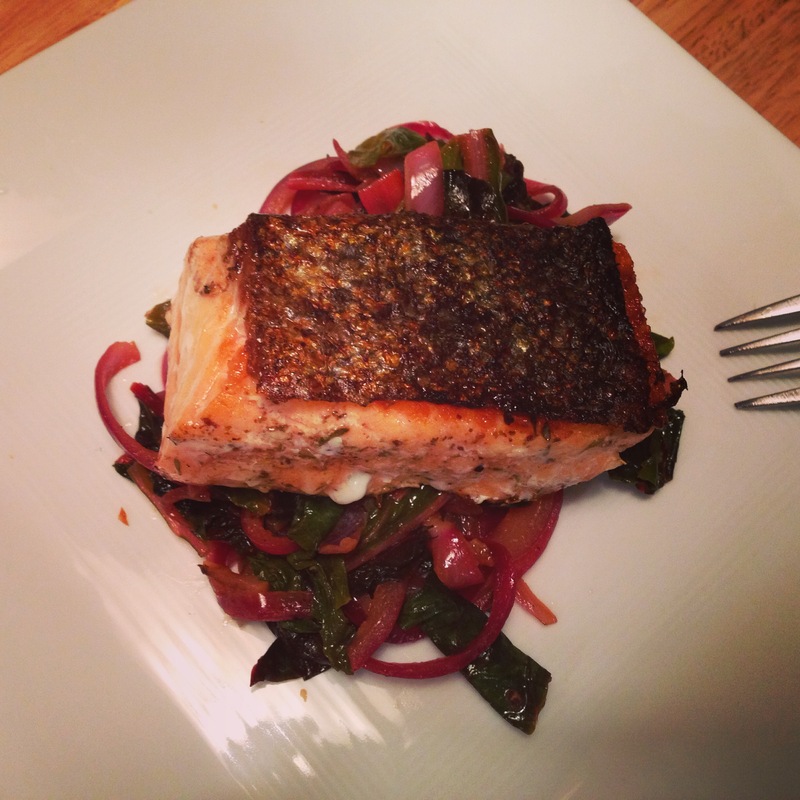 😉 This is a wonderful, light, and elegant way to serve salmon, which packs a powerhouse of omega-3 fats, lean protein, vitamin D, vitamin B12/B3/B6, selenium, and phosphorus. 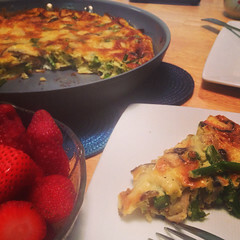 The recipe is also easily adapted to use other ingredients you may have at hand – capers and lemons, tomatoes and olives, asparagus and leeks – the possibilities are endless! 1. 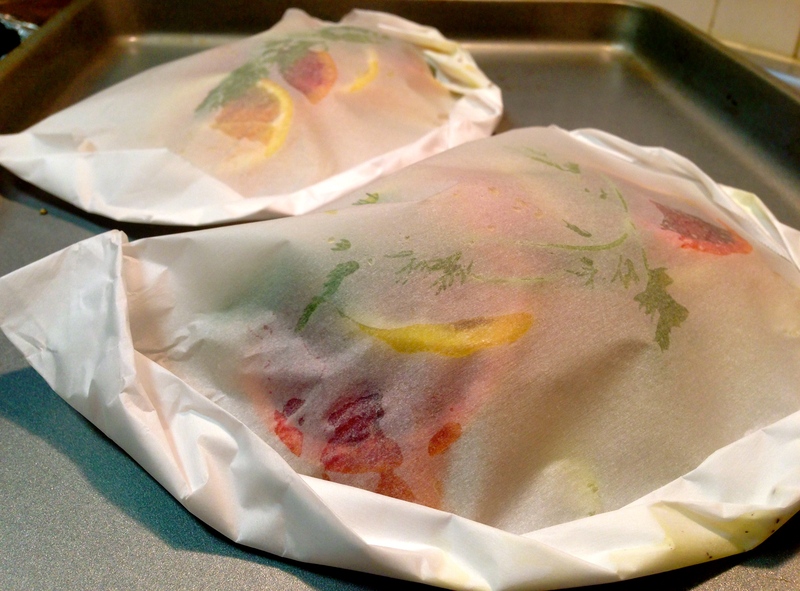 Preheat oven to 400 degrees F. Cut four 12-by-17-inch pieces of parchment paper. Fold each in half crosswise to make a crease, then unfold and lay flat. 2. 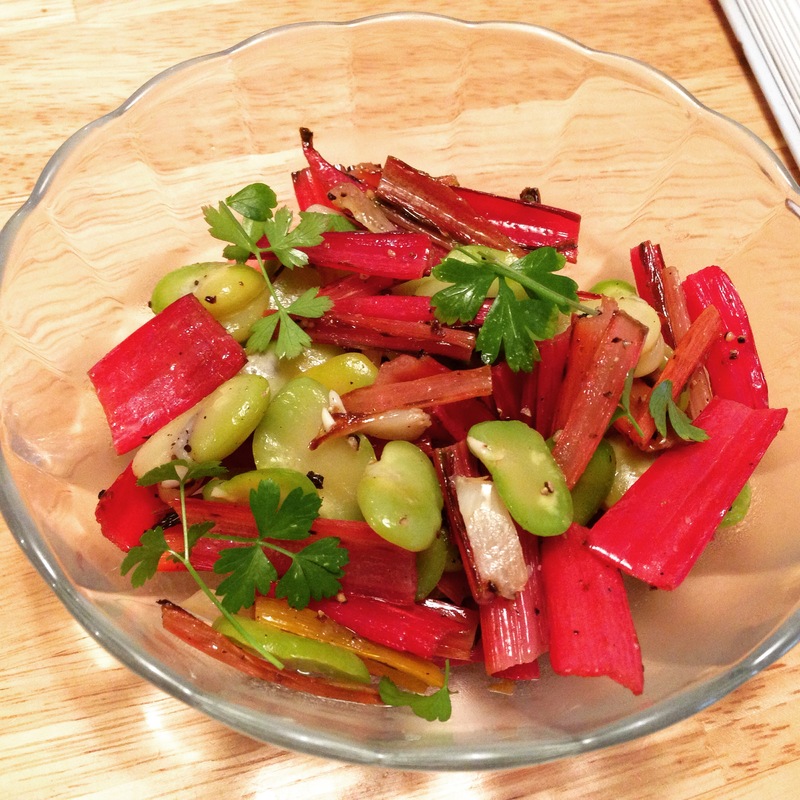 In a bowl, toss together 2 tsp olive oil, sliced fennel, blood orange, and lemon slices. 3. Season salmon fillets liberally with salt and pepper. 4. 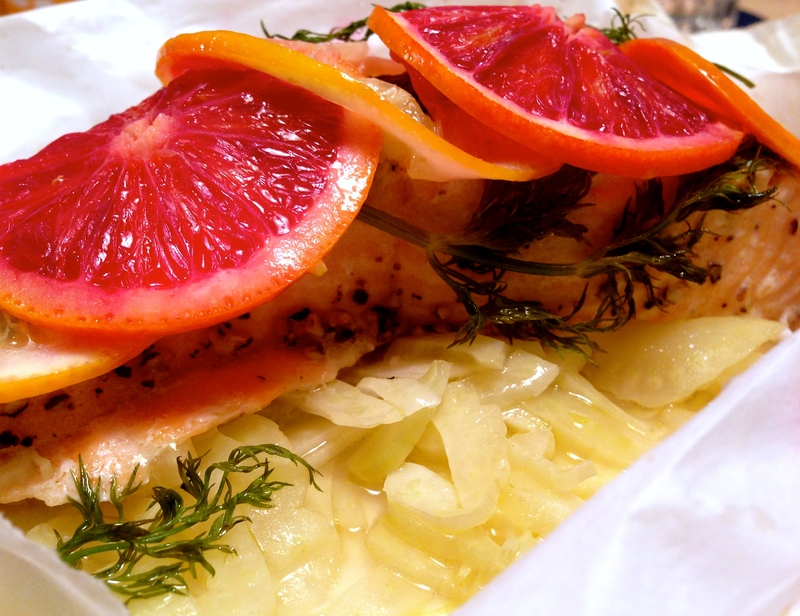 Arrange fennel in a small mound on parchment paper near the crease. 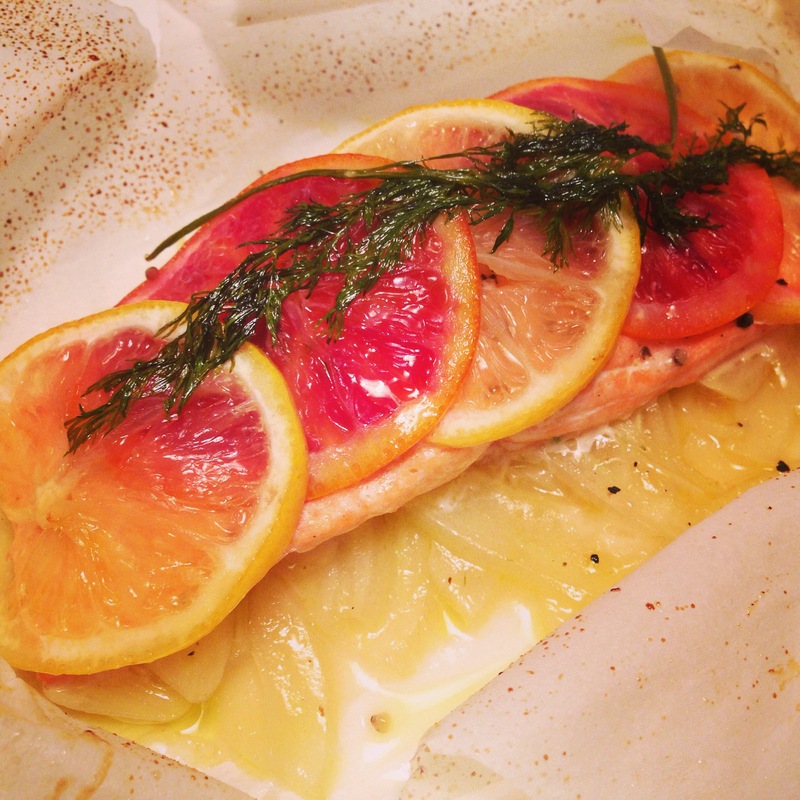 Place salmon on top of the fennel and drizzle with 1 tsp olive oil and 1 tsp lemon juice. 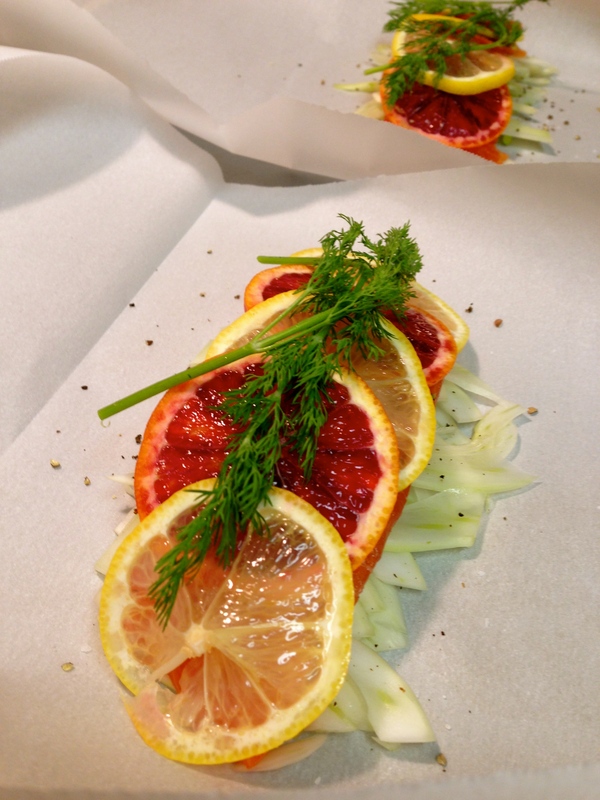 Top with dill and then layer orange and lemon slices on top, alternating slices. 5. Fold each piece of parchment over, then make small overlapping pleats to seal open sides, creating half-moon-shaped packets. 6. Bake on rimmed baking sheet for about 10 minutes, until packets are slightly puffed. 7. 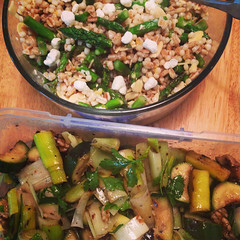 Transfer to plates and carefully cut packets open with kitchen shears or a small knife. Enjoy!